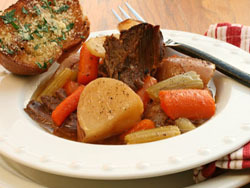 This is a basic crock pot roast using a slow cooker. Depending on the meat you purchased determines if you should brown the meat or not. If the meat is well trimmed and not highly marbled, it need not be browned. Trim excess fat from roast and wipe down with paper towel to absorb excess moisture. Combine 1/4 cup flour, salt and pepper. Coat roast with mixture. Place all vegetables in pot at the bottom except the mushrooms and peas. Place roast over vegetables. Pour 1/4 cup water over meat and vegetables. Cover and cook on low 7 - 10 hours. An hour before serving, turn crock pot to high temperature. Mix the 3 tbl flour and water making a smooth paste, stir into crock pot. This will make a nice gravy. Season with salt and pepper as desired. Add frozen peas for the last hour of cooking. Substitute the flour/water mixture with can of any cream soup. Remove meat and all vegetables placing on a serving dish. Pour some of the liquid into a pot and add soup. Stir and heat thoroughly and serve with pot roast.